Are you thinking SUMMER or are you thinking SCHOOL? My horse lover and I live in Eastern Pennsylvania. Like most schools in the Northeast, she starts back to school the day after Labor Day .... September 7th. In some areas, though, school started today, August 2nd! Either way, its hot! 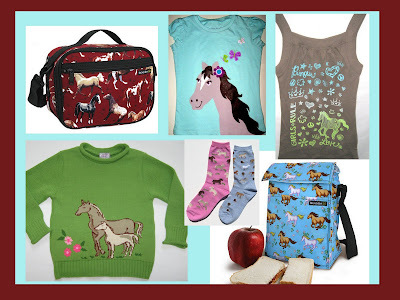 Whether you are thinking about back to school gear with horses, thinking ahead to tights and sweaters, or know she'll need tank tops and cap sleeved tees for the next few months --we have some of everything - with horses of course - at Girls Horse Clothes right now. To make it easy for you... we've added "Doors" on our website... Want tank tops and tees with horses? Just click the door to Summer! Want Horse Lunch Boxes and Bags? Or tights and jackets with horses? ... Click the School Door! .... Not sure what you want, as long as it has horses and is at great savings? Click the Saving Door.